This is a timeline of the War in Donbass, for December 2018. The timeline follows an ongoing conflict between Ukraine and anti-government pro-Russian separatists supported by Russia in the Donbass region in eastern Ukraine. The spokesman of the Ukrainian operational headquarters reported in the morning, that pro-Russian troops had opened fire on 6 occasions on Ukrainian positions the previous day (on 3 occasions both in Donetsk and Luhansk region); the fire was returned on several occasions. By noon of 1 December no ceasefire violations were reported by the Ukrainian side. The spokesman of the Ministry of Defence reported at noon no casualties the Donbass region on the last day of November. Pro-Russian officials at Donetsk city reported 19 Ukrainian violations of the ceasefire in 13 locations using small arms, heavy machine guns, snipers, automatic grenade launchers and 73 mm antitank recoilless rifles. Officials from the self-proclaimed Luhansk People's Republic recorded three Ukrainian violations of the truce within the republic boundaries. BMP-1 armoured vehicles engaged pro-Russian positions at Zolote; the same area was shelled with 82 mm mortars. BMP-2 armoured vehicles from Luhanske attacked on pro-Russian redoubts at Lohvynove supported by 120 mm mortar fire. According to the information provided by the press-centre of the JFO in the evening, pro-Russian military had opened fire on positions of Ukrainian troops on 7 occasions. By the end of the day total 15 ceasefire violations were registered, with no casualties on the Ukrainian side. In the outskirts of Donetsk city and in the region of Mariupol, Krasnohorivka, Pavlopil, Lebedinske, Marinka, Chermalyk, Nevelske, Slavne, Taramchuk, Bohdanivka and Piski became the target of small arms, heavy machine guns and antitank rocket launchers. In the northern section of the demarcation line, Krymske was shelled with 82 mm mortars. According to the information provided by the spokesman of the Ukrainian operational headquarters in the morning, pro-Russian troops had opened fire on 15 occasions on Ukrainian positions the previous day (including on 14 occasions in Donetsk region and once in Luhansk region); the fire was returned on more half of the occasions. By noon of 2 December no ceasefire violations were registered. The spokesman of the Ministry of Defence reported at noon no casualties in the Donbass region on the first day of December. Pro-Russian authorities at Donetsk city reported 21 Ukrainian violations of the ceasefire in 11 locations using small arms, heavy machine guns, automatic grenade launchers, 73 mm antitank recoilless rifles and 120 mm mortars. Local officials from the self-proclaimed Luhansk People's Republic recorded one Ukrainian violation of the truce, when BMP-1 armoured vehicles from Troitske launched an attack on Kalynove. The press-centre of the JFO reported in the evening that pro-Russian military had not committed any ceasefire violations by evening. By the end of the day 7 ceasefire violations were registered with no casualties on the Ukrainian side. In the area around of Donetsk city, pro-Russian forces fired infantry weapons and antitank rocket launchers at Krasnohorivka, Slavne, Taramchuk and Lebedinske. Small arms fire was reported at Olenivka. Ukrainian troops at Stanytsia Luhanska, in the northern sector of the demarcation line, were harassed with machine gun fire. Pro-Russian sources from Donetsk city told the press that Ukrainian forces had broken the ceasefire on several occasions by evening. In the area of Donetsk city pro-Russian forces at Dokuchaevsk, Spartak, Yasynovataya, Kruta Balka, Staromykhailivka, Oleksandrivka, Kashtanove and Olenovka became the target of small arms, grenade launchers, 120 mm mortars and armoured fighting vehicles. In the region of Mariupol, Ukrainian forces engaged pro-Russian positions at Sakhanka, Uzhivka and Pikuzy using small arms, 82 mm mortars and armoured fighting vehicles. Small arms fire was reported at Gagarin mining complex, in the outskirts of Horlivka. A Ukrainian drone was shot down over Zholobok, in an area controlled by the self-proclaimed Luhansk People's Republic. The spokesman of the Ukrainian operational headquarters reported in the morning, that pro-Russian troops had opened fire on 7 occasions on Ukrainian positions the previous day (including on 6 occasions in Donetsk region and once in Luhansk region); the fire was returned on 5 occasions. In the area of Donetsk city and in the region of Mariupol, Pisky was hit by 82 mm and 120 mm mortar volleys. Ukrainian positions at Troitske, Pisky, Slavne, Hnutove, Chermalyk, Vodiane and Avdiivka were meanwhile the target of infantry weapons and rocket launchers. In the northern section of the demarcation line, antitank rockets and 82 mm mortar rounds landed in Krymske. Small arms and rocket launchers were fired at Ukrainian troops around Stepne. By morning of 3 December (as of 11:00 am) one ceasefire violation was registered. The spokesman of the Ministry of Defence reported at noon no casualties in the Donbass region on 2 December. Pro-Russian sources at Donetsk city recorded 18 Ukrainian violations of the ceasefire in 12 different locations employing small arms, heavy machine guns, automatic grenade launchers, 73 mm antitank recoilless rifles, antiaircraft artillery, 82 mm mortars, 120 mm mortars, armoured personnel carriers and armoured fighting vehicles. Officials from the self-proclaimed Luhansk People's Republic recorded three Ukrainian violations of the truce within the republic boundaries. The Ukrainian military used small arms, heavy machine guns and 82 mm mortars to attack pro-Russian forces at Sentianivka, Krasnyi Yar and Knyaz Igor memorial. According to the information provided by the press-centre of the JFO in the evening, pro-Russian military had opened fire on positions of Ukrainian troops on 3 occasions. By the end of the day total 14 ceasefire violations were registered, two Ukrainian servicemen were wounded. Pro-Russian officials at Donetsk city recorded a number of Ukrainian violations of the ceasefire throughout the day. Trudivske, Volvo Center and Spartak, in the environs of Donetsk city, Ozeryanivka, in the area of Horlivka, and, in the region of Mariupol, Sakhanka and Uzhivka, came under attack. In the main incidents, Uzhivka and Sakhanka were shelled with 82 mm mortars, while pro-Russian positions at Ozeryanivka became the target of ZU-23-2 antiaircraft guns. Spartak, Volvo Center and Sakhanka were fired at from 73 mm antitank recoilless rifles. According to the information provided by the spokesman of the Ukrainian operational headquarters in the morning, pro-Russian troops had opened fire on 14 occasions on Ukrainian positions the previous day (including on 11 occasions in Donetsk and on 3 occasions in Luhansk region); the fire was returned on several occasions. By noon of 4 December four ceasefire violations were was registered, with no casualties on the Ukrainian side. The spokesman of the Ministry of Defence confirmed at noon that two Ukrainian servicemen were wounded in the Donbass region on 3 December. Pro-Russian authorities at Donetsk city reported 17 Ukrainian violations of the ceasefire in seven locations using small arms, heavy machine guns, automatic grenade launchers, 73 mm antitank recoilless rifles, 82 mm mortars and antiaircraft guns. Sources from the self-proclaimed Luhansk People's Republic recorded seven Ukrainian violations of the truce within the republic's borders. The Ukrainian miliitary used small arms, heavy machine guns, automatic grenade launchers, antitank rockets, 73 mm antitank recoilless rifles, 82 mm mortars, 120 mm mortars, BMP-1 armoured vehicles and 122 mm self-propelled artillery to engage pro-Russian forces at Zholobok, Donetskyi, Kalynove, Sentianivka and Knyaz Igor memorial. The press-centre of the JFO reported in the evening that pro-Russian military had opened fire on positions of Ukrainian troops on 11 occasions, one Ukrainian soldier was killed. By the end of the day total 24 ceasefire violations were registered, three Ukrainian servicemen were wounded. In the outskirts of Donetsk city and in the region of Mariupol, 82 mm mortar volleys struck Pisky, Vodiane and Shyrokyne. Pro-Russian armoured fighting vehicles engaged Ukrainian redoubts at Vodiane, while antitank guided missiles hit Krasnohorivka. Small arms and heavy machine guns were fired at Pisky, Shyrokyne, Starohnativka, Vodiane, Novomykhailivka, Berezove, Avdiivka, Slavne and Taramchuk. In the northern sector of the demarcation line, Luhanske received fire from 82 mm and 120 mm mortars, while Krymske and Novozvanivka were hit by 82 mm mortar rounds. Pro-Russian armoured fighting vehicles opened fire on Ukrainian positions at Troitske. Sniper fire was reported at Novozvanivka. Pro-Russian officials from Donetsk city recorded a series of Ukrainian violations of the truce throughout the day. The Ukrainian military opened fire on pro-Russian positions at Zhabicheve, Yasynuvata, Vasiilivka, Volvo Center, Spartak, Kruta Balka, Trudivske and Oleksandrivka, in the environs of Donetsk city, Zaitseve, Dolomitne and Gagarin mining complex, in the area of Horlivka, and Sakhanka, in the region of Mariupol. In the main incidents, Volvo Center became the target of 120 mm mortar. Yasynuvata and Spartak were hit by 82 mm mortar fire. Vasiilivka, Kruta Balka, Gagarin mining complex and Sakhanka received fire from 73 mm antiaircraft recoilless rifles. A Ukrainian drone was shot down by pro-Russian ground forces while on route from Shchastya to Luhansk, within the boundaries of the self-proclaimed Luhansk People's Republic. The unmanned aircraft was armed with a VOG-17 grenade launcher. The spokesman of the Ukrainian operational headquarters reported in the morning, that pro-Russian troops had opened fire on 24 occasions on Ukrainian positions the previous day (including on 18 occasions in Donetsk region and on 6 occasions in Luhansk region); the fire was returned on 15 occasions. By morning of 5 December (as of 11:00 am) one ceasefire violation was registered with no casualties on the Ukrainian side. The spokesman of the Ministry of Defence confirmed at noon that one Ukrainian serviceman was killed and another three were wounded in action in the Donbass region on 4 November. Pro-Russian sources at Donetsk city recorded 22 Ukrainian violations of the ceasefire in 12 different locations employing small arms, heavy machine guns, automatic grenade launchers, 73 mm antitank recoilless rifles, 82 mm and 120 mm mortars. Officials from the self-proclaimed Luhansk People's Republic recorded six Ukrainian violations of the truce within the republic boundaries. Ukrainian forces used small arms, under-barrels launched grenades, antitank rocket launchers, 82 mm mortars, 120 mm mortars and BMP-1 armoured vehicles to attack pro-Russian positions at Smile, Zholobok, Veselehorivka, Lohvynove, Kalynove and Knyaz Igor memorial. According to the information provided by the press-centre of the JFO in the evening, pro-Russian military had opened fire on positions of Ukrainian troops on 8 occasions, one Ukrainian soldier was wounded. By the end of the day total 15 ceasefire violations were registered. Pro-Russian sources told the press that Ukrainian forces had broken the ceasefire on several occasions by evening. Kruta Balka, Yasynuvata, Vasiilivka, Oleksandrivka, Abakumove, Mineralne, Trudivske, Spartak and Volvo Center, in the outskirts of Donetsk city, Ozeryanivka, Gagarin mining complex, Shyroka Balka and Holmivsky, in the area of Horlivka, and Uzhivka, in the region of Mariupol, came under hostile fire. In the main incidents, BMP-1 armoured fighting vehicles from Nevelske and Troitske engaged pro-Russian positions at Abakumove and Ozeryanivka, respectively. BMP-2 armoured vehicles from Avdiivka opened fire on Yasynuvata. Vasiilivka and Shyroka Balka became the target of ZU-23-2 antiaircraft guns. According to the information provided by the spokesman of the Ukrainian operational headquarters in the morning, pro-Russian troops had opened fire on 15 occasions on Ukrainian positions the previous day (including on 11 occasions in Donetsk region and on 5 occasions in Luhansk region, all at Vilnyi (ESE part of Zolote, 48°40′59″N 38°33′2″E﻿ / ﻿48.68306°N 38.55056°E﻿ / 48.68306; 38.55056), where 82 mm mortars were employed on about 60 occasions); the fire was returned on 8 occasions. By noon of 6 December no ceasefire violations were registered. The spokesman of the Ministry of Defence confirmed at noon that one Ukrainian serviceman was wounded in the Donbass region on 5 December. Pro-Russian officials at Donetsk city recorded 20 Ukrainian violations of the ceasefire in 15 different locations using small arms, heavy machine guns, automatic grenade launchers, 73 mm antitank recoilless rifles, antiaircraft artillery, armoured personnel carriers and armoured fighting vehicles. Officials from the self-proclaimed Luhansk People's Republic recorded five Ukrainian violations of the truce within the republic boundaries. The Ukrainian miliitary used small arms, heavy machine guns, 73 mm antitank recoilless rifles and 82 mm to attack pro-Russian forces at Zolote, Smile and Lozove. The press-centre of the JFO reported in the evening, that pro-Russian military had opened fire on positions of Ukrainian troops on 3 occasions. By the end of the day total 6 ceasefire violations were registered, as a result, one Ukrainian soldier was wounded. Pro-Russian sources from Donetsk city told the press that Ukrainian forces had broken the ceasefire on several occasions by evening. Yasynuvata, Trudivske, Kruta Balka, Oleksandrivka, Spartak, Volvo Center and Yakovlivka, in the surroundings of Donetsk city, Verkhnyotoretske, in the area of Horlivka, and, in the region of Mariupol, Sakhanka, Uzhivka, Pikuzy and Novoshyrokivske, came under attack. In the main incidents, heavy shelling was reported at Verkhnyotoretske, where Ukrainian positions were hit by 82 mm mortar barrages and intense fire from automatic grenade launchers; 82 mm mortar rounds also landed in Volvo Center and Yakovlivka. BMP-1 armoured fighting vehicles from Butivka mining complex opened fire on Spartak. Uzhivka and Oleksandrivka became the target of 73 mm antitank recoilless rifles. The spokesman of the Ukrainian operational headquarters reported in the morning, that pro-Russian troops had opened fire on 6 occasions on Ukrainian positions the previous day (including on 5 occasions in Donetsk and once in Luhansk region); the fire was returned on several occasions. By noon of 7 December three ceasefire violations were was registered with no casualties on the Ukrainian side. The spokesman of the Ministry of Defence confirmed at noon that one Ukrainian serviceman was wounded in action in the Donbass region on 6 December. Pro-Russian sources at Donetsk city recorded 18 Ukrainian violations of the ceasefire in 12 different locations employing small arms, heavy machine guns, automatic grenade launchers, 73 mm antitank recoilless rifles, 82 mm mortars and armoured personnel carriers and armoured fighting vehicles. Officials from the self-proclaimed Luhansk People's Republic recorded three Ukrainian violations of the truce within the republic boundaries. The Ukrainian military used small arms, antitank rockets, 82 mm mortars and 120 mm mortars to attack pro-Russian forces at Zholobok, Donetskyi and Smile. According to the information provided by the press-centre of the JFO in the evening, pro-Russian military had opened fire on positions of Ukrainian troops on 5 occasions. By the end of the day total 13 ceasefire violations were registered, two Ukrainian servicemen were wounded, one of them lethally. According to the information provided by the spokesman of the Ukrainian operational headquarters in the morning, pro-Russian troops had opened fire on 13 occasions on Ukrainian positions the previous day (including on 11 occasions in Donetsk region and twice in Luhansk region); the fire was returned on 4 occasions. By noon 8 December no ceasefire violations were registered. The spokesman of the Ministry of Defence confirmed at noon that one Ukrainian serviceman was killed and another Ukrainian soldier was wounded in the Donbass region on 7 December. Pro-Russian sources at Donetsk city reported 20 Ukrainian violations of the ceasefire in 16 locations using small arms, heavy machine guns, automatic grenade launchers, 73 mm antitank recoilless rifles, armoured personnel carriers and armoured fighting vehicles. An elderly female resident was wounded near Horlivka. No ceasefire violations were recorded by local authorities within the borders of the self-proclaimed Luhansk People's Republic. The press-centre of the JFO reported in the evening that pro-Russian military had opened fire on positions of Ukrainian troops on 8 occasions, one Ukrainian serviceman had suffered minor injuries as a result. By the end of the day a total of 13 ceasefire violations were registered. The spokesman of the Ukrainian operational headquarters reported in the morning, that pro-Russian troops had opened fire on 13 occasions on Ukrainian positions the previous day (including on 8 occasions in Donetsk region and on 5 occasions in Luhansk region); the fire was returned on 7 occasions. By morning of 9 December (as of 11:00 am) one ceasefire violation was registered at Hnutove with no casualties on the Ukrainian side; the fire was not returned. The spokesman of the Ministry of Defence confirmed at noon that one Ukrainian serviceman had suffered minor injuries in the Donbass region on 8 December. Pro-Russian sources at Donetsk city recorded 20 Ukrainian violations of the ceasefire in 12 different locations employing small arms, heavy machine guns, automatic grenade launchers, 73 mm antitank recoilless rifles, 82 mm mortars and armoured personnel carriers and armoured fighting vehicles. Officials from the self-proclaimed Luhansk People's Republic recorded six Ukrainian violations of the truce within the republic boundaries. The Ukrainian military used 82 mm mortars, 120 mm mortars and 122 mm self-propelled artillery to shell pro-Russian forces at Smile, Zholobok, Kalynivka and Lohvynove. According to the information provided by the press-centre of the JFO in the evening, pro-Russian military had opened fire on positions of Ukrainian troops on 11 occasions, as a result, one Ukrainian soldier was wounded. By the end of the day total 14 ceasefire violations were registered. According to the information provided by the spokesman of the Ukrainian operational headquarters in the morning, pro-Russian troops had opened fire on 14 occasions on Ukrainian positions the previous day (including on 9 occasions in Donetsk region and on 5 occasions in Luhansk region); the fire was returned on 7 occasions. By noon 10 December two ceasefire violations were registered with no casualties on the Ukrainian side. The spokesman of the Ministry of Defence confirmed at noon that one Ukrainian serviceman was wounded in the Donbass region on 9 December. Pro-Russian officials at Donetsk city reported 21 Ukrainian violations of the ceasefire in 12 locations using small arms, heavy machine guns, automatic grenade launchers, 73 mm antitank recoilless rifles, 82 mm mortars, 120 mm mortars, antiaircraft guns, armoured personnel carriers and armoured fighting vehicles. Officials from the self-proclaimed Luhansk People's Republic recorded nine Ukrainian violations of the truce within the republic boundaries. Ukrainian forces used small arms, heavy machine guns, automatic grenades launchers, antitank recoilless rifles, 82 mm mortars, 120 mm mortars and BMP-1 armoured vehicles to engage pro-Russian positions at Holubovske, Donetskyi, Zholobok, Lohvynove, Kalynove, Lozove, Zolote and Knyaz Igor memorial. The press-centre of the JFO reported in the evening that pro-Russian military had opened fire on positions of Ukrainian troops on 7 occasions. By the end of the day total 12 ceasefire violations were registered with no casualties on the Ukrainian side. Pro-Russian sources from Donetsk city told the press that Ukrainian forces had broken the ceasefire on several occasions by evening. Yasynuvata, Trudivske, Volvo center, Kruta Balka and Oleksandrivka, in the surroundings of Donetsk city, Gagarin mining complex Zaitseve and Dolomitne, in the region of Horlivka, and, in the region of Mariupol, Sakhanka and Uzhivka, came under hostile fire. Most incidents involved the use of small arms, heavy machine guns and automatic grenade launchers. Sakhanka, Trudivske, Dolomitne and Oleksandrivka became the target of 73 mm antitank recoilless rifles. The spokesman of the Ukrainian operational headquarters reported in the morning, that pro-Russian troops had opened fire on 12 occasions on Ukrainian positions the previous day (including on 8 occasions in Donetsk region and on 4 occasions in Luhansk region); the fire was returned on more than half of the occasions. By noon of 11 December four ceasefire violations were registered with no casualties on the Ukrainian side. The spokesman of the Ministry of Defence reported at noon no casualties in the Donbass region on 10 November. Pro-Russian officials at Donetsk city reported 21 Ukrainian violations of the ceasefire in 12 locations using small arms, heavy machine guns, automatic grenade launchers and 73 mm antitank recoilless rifles. Sources from the self-proclaimed Luhansk People's Republic recorded three Ukrainian violations of the truce within the republic boundaries. The Ukrainian military used heavy machine guns, 82 mm mortars, 120 mm mortars and BMP-1 armoured vehicles to attack pro-Russian forces at Donetskyi, Kalynove and Slavyanoserbsk. According to the information provided by the press-centre of the JFO in the evening, pro-Russian military had opened fire on positions of Ukrainian troops on 10 occasions, as a result, two Ukrainian servicemen were wounded. By the end of the day total 11 ceasefire violations were registered. Pro-Russian authorities from Donetsk city reported a series of Ukrainian violations of the ceasefire by evening. Oleksandrivka, Trudiivske, Spartak, Kashtanove, Kruta Balka, Vasiilivka, Yasynuvata, and Donetsk airport, in the surroundings of Donetsk city, Zaitseve and Gagarin mining complex, in the area of Horlivka, and Uzhivka, in the region of Mariupol, came under attack. In the main incidents, BMP-1 armoured vehicles from Avdiivka and Kamianka engaged pro-Russian positions at Spartak and Kruta Balka, respectively. BMP-2 armoured vehicles from Vodiane and Kamianka riddled pro-Russian redoubts at Vasiilivka and Uzhivka with 30 mm gunfire. ZU-23-2 antiaircraft guns were fired at Kashtanove and 73 mm antitank recoilless rifles opened fire on Yasynuvata. According to the information provided by the spokesman of the Ukrainian operational headquarters in the morning, pro-Russian troops had opened fire on 11 occasions on Ukrainian positions the previous day (including on 9 occasions in Donetsk and twice in Luhansk region); the fire was returned on 5 occasions. By morning of 12 December (as of noon 11:00 am) three ceasefire violations were registered with no casualties on the Ukrainian side; the fire was returned on all occasions. The spokesman of the Ministry of Defence confirmed at noon that two Ukrainian servicemen were wounded in the Donbass region on 11 December. Pro-Russian officials at Donetsk city recorded 19 Ukrainian violations of the ceasefire in 12 different locations using small arms, heavy machine guns, automatic grenade launchers, 73 mm antitank recoilless rifles, 120 mm mortars, antiaircraft artillery, armoured personnel carriers and armoured fighting vehicles. Sources from the self-proclaimed Luhansk People's Republic recorded three Ukrainian violations of the truce within the republic boundaries. The Ukrainian military used small arms, heavy machine guns, automatic grenade launchers and 120 mm mortars to attack pro-Russian forces at Smile, Kalynivka and Knyaz Igor memorial. The press-centre of the JFO reported in the evening that pro-Russian military had opened fire on positions of Ukrainian troops on 7 occasions with no casualties on the Ukrainian side. By the end of the day no more ceasefire violations were registered. Pro-Russian authorities from Donetsk city recorded several Ukrainian violations of the ceasefire by evening. Zhabicheve, Trudivske, Spartak, Oleksandrivka, Yasynuvata and Kruta Balka, in the outskirts of Donetsk city, Gagarin mining complex and Zaitseve, in the area of Horlivka, and, in the region of Mariupol, Uzhivka and Sakhanka, were attacked by Ukrainian forces. In the main incidents, Sakhanka became the target of 120 mm mortars, while 82 mm mortar rounds landed in Naberezhne and Zhabicheve. Heavy fire from ZU-23-2 antiaircraft guns was reported at Zhabicheve. The spokesman of the Ukrainian operational headquarters reported in the morning, that pro-Russian troops had opened fire on 7 occasions on Ukrainian positions the previous day (including on 6 occasions in Donetsk region and once in Luhansk region, at Krymske); the fire was returned on more than half of the occasions. By noon noon of 13 December three ceasefire violations were was registered with no casualties on the Ukrainian side. The spokesman of the Ministry of Defence reported at noon no casualties in the Donbass region on 12 November. Pro-Russian sources at Donetsk city recorded 18 Ukrainian violations of the ceasefire in 12 different locations employing small arms, heavy machine guns, automatic grenade launchers, 73 mm antitank recoilless rifles, 82 mm mortars, 120 mm mortars and antiaircraft guns. Authorities from the self-proclaimed Luhansk People's Republic recorded six Ukrainian violations of the truce within the republic boundaries. Ukrainian forces used small arms, under-barrels launched grenades, antitank rocket launchers, 82 mm mortars, 120 mm mortars, BMP-1 armoured vehicles and 122 mm self-propelled artillery to attack pro-Russian positions at Smile, Donetskyi and Kalynove. According to the information provided by the press-centre of the JFO in the evening, pro-Russian military had opened fire on positions of Ukrainian troops on 9 occasions, one Ukrainian soldier was killed by a sniper bullet. By the end of the day total 22 ceasefire violations were registered, another Ukrainian serviceman was killed. In the area of Donetsk city and in the region of Mariupol, Vodiane and Hnutove were shelled with 82 mm and 120 mm mortars. Pro-Russian armoured fighting vehicles attacked Ukrainian positions around Hnutove, while infantry weapons and rocket launchers were fired at Marinka, Krasnohorivka, Lebedinske, Avdiivka, Hnutove, Nevelske, Vodiane and Shyrokyne. Sniper fire was reported at Nevelske and Hnutove. In the northern sector of the demarcation line, 82 mm and 120 mm mortars landed in Khutora Vilnyi. Antitank rockets were fired at Ukrainian redoubts near Krymske. Heavy machine gun fire was reported at Novhorodske. Pro-Russian sources told the press that Ukrainian forces had broken the ceasefire on several occasions by evening. 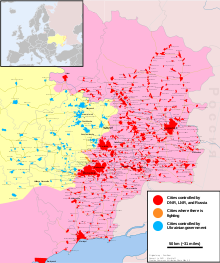 Kruta Balka, Yasynuvata, Staromykhailivka, Dokuchaievsk, Trudivske, Spartak and Volvo Center, in the outskirts of Donetsk city, Dolomitne and Zaitseve, in the area of Horlivka, and, in the region of Mariupol, Sakhanka, Uzhivka and Pikuzy, came under hostile fire. In the main incidents, BMP-1 armoured vehicles from Travneve launched a sustained attack on Dolomitne supported by ZU-23-2 antiaircraft guns and 73 mm antitank recoilless rifles. Pro-Russian forces at Staromykhailivka, Trudivske, Uzhivka and Sakhanka became the target of BMP-1 armoured vehicles from Krasnohorivka, Marinka, Vodiane and Shyrokyne. A Phantom-10 type drone was shot down by pro-Russian forces over Lohvynove. According to the information provided by the spokesman of the Ukrainian operational headquarters in the morning, pro-Russian troops had opened fire on 22 occasions on Ukrainian positions the previous day (including on 19 occasions in Donetsk region and on 3 occasions in Luhansk region); the fire was returned on several occasions. By noon of 14 December four ceasefire violations were registered with no casualties on the Ukrainian side. The spokesman of the Ministry of Defence reported at noon that two Ukrainian servicemen (born in 1973 and in 1996) were killed in the Donbass region on 13 December. Pro-Russian officials at Donetsk city reported 21 Ukrainian violations of the ceasefire in 12 locations using small arms, heavy machine guns, snipers, automatic grenade launchers, 73 mm antitank recoilless rifles, 82 mm mortars, 120 mm mortars, antiaircraft guns, armoured personnel carriers and armoured fighting vehicles. The same sources reported 140 Ukrainian violations of the truce over the past week; 70 rounds from 82 mm and 120 mm mortars were fired at pro-Russian positions, while armoured fighting vehicles engaged pro-Russian forces on several occasions. Authorities from the self-proclaimed Luhansk People's Republic recorded three Ukrainian violations of the truce within the republic boundaries. The Ukrainian military used heavy machine guns, 73 mm antitank recoilless rifles, 120 mm mortars, ZU-23-2 antiaircraft guns and BMP-1 armoured vehicles to engage pro-Russian forces at Lozove, Zolote and Veselehorivka. The press-centre of the JFO reported in the evening that pro-Russian military had opened fire on positions of Ukrainian troops on 8 occasions, employing 82 mm mortars at Vilnyi and in the area of Svitlodarsk; one Ukrainian serviceman suffered minor injuries. By the end of the day total 10 ceasefire violations were registered, no further casualties were reported. In the outskirts of Donetsk city and in the region of Mariupol, pro-Russian armoured fighting vehicles engaged Ukrainian positions at Vodiane. Hnutove became the target of 73 mm antitank recoilless rifles, while Marinka and Starohnativka were shelled with antitank rocket launchers. In the northern sector of the demarcation line, heavy shelling was reported at Vilnyi, which became the target of antitank rocket launchers, 82 mm mortars and ZU-23-2 antiaircraft guns. Svitlodarsk was hit by infantry weapons antitank rockets and 82 mm mortar rounds. Pro-Russian officials from Donetsk city recorded a series of Ukrainian violations of the truce throughout the day. The Ukrainian military opened fire on pro-Russian positions at Zhabicheve, Yasynuvata, Vasiilivka, Volvo Center, Spartak, Kruta Balka, Trudivske, Kashtanove, Mineralne, Staromykhailivka and Oleksandrivka, in the environs of Donetsk city, Zaitseve, Dolomitne, Shyroka Balka, Izotove and Gagarin mining complex, in the area of Horlivka, and, in the region of Mariupol, Sakhanka and Uzhivka. In the main incidents, BMP-1 armoured vehicles from Shyrokyne launched a sustained attack on Pro-Russian positions around Sakhanka in the early hours of the day, supported by 82 mm and 120 mm mortar fire. The area was also shelled from automatic grenade launchers. Uzhivka was hit by 120 mm mortar rounds, while 82 mm mortars were fired at Gagarin mining complex, Izotove and Volvo Center. BMP-1 armoured vehicles from Kamianka, Novhorodske and Avdiivka engaged pro-Russian positions at Vasiilivka, Shyroka Balka and Mineralne. BMP-2 armoured vehicles from Butivka mining complex and Krasnohorivka fired their 30 mm cannons at pro-Russian redoubts around Spartak and Staromykhailivka, respectively. Pro-Russian troops at Kruta Balka received fire from ZU-23-2 antiaircraft guns. The spokesman of the Ukrainian operational headquarters reported in the morning, that pro-Russian troops had opened fire on 10 occasions on Ukrainian positions the previous day (including on 8 occasions in Donetsk and twice in Luhansk region); the fire was returned on 4 occasions. By morning of 15 December (as of 11:00 am) two ceasefire violations were registered with no casualties on the Ukrainian side; the fire was not returned. The spokesman of the Ministry of Defence confirmed at noon that one Ukrainian serviceman was wounded in the Donbass region on 14 November. Pro-Russian officials at Donetsk city reported 22 Ukrainian violations of the ceasefire in 18 locations using small arms, heavy machine guns, automatic grenade launchers, 73 mm antitank recoilless rifles, 82 mm mortars, 120 mm mortars, antiaircraft guns, armoured personnel carriers and armoured fighting vehicles. Sources from the self-proclaimed Luhansk People's Republic recorded five Ukrainian violations of the truce within the republic boundaries. Ukrainian forces used small arms, heavy machine guns, snipers, automatic grenade launchers, antitank rocket launchers, 82 mm mortars, 120 mm mortars and BMP-1 armoured vehicles to attack pro-Russian positions at Sokolniki, Lohvynove, Zolote, Kalynivka and Krasnyi Yar. One pro-Russian serviceman was killed. According to the information provided by the press-centre of the JFO in the evening, pro-Russian military had targeted positions of Ukrainian troops on 9 occasions, including from 120 mm and 82 mm mortars; one Ukrainian soldier was killed by a sniper, another was wounded. By the end of the day total 12 ceasefire violations were registered. Pro-Russian sources from Donetsk city told the press that Ukrainian forces had broken the ceasefire on several occasions by evening. Yasynuvata, Trudivske, Spartak, Oleksandrivka, Kruta Balka and Zhabicheve, in the surroundings of Donetsk city, and, in the region of Mariupol, Sakhanka, Uzhivka and Novoshyrokivske, came under attack. In the main incidents, 120 mm mortar rounds landed in Uzhivka and Zhabicheve, while ZU-23-2 antiaircraft guns were fired at Ukrainian positions near Yasynuvata. According to the information provided by the spokesman of the Ukrainian operational headquarters in the morning, pro-Russian troops had opened fire on 12 occasions on Ukrainian positions the previous day (including on 10 occasions in Donetsk region and twice in Luhansk region); the fire was returned on several occasions. By noon of 16 December two ceasefire violations were registered with no casualties on the Ukrainian side. The spokesman of the Ministry of Defence reported at noon that one Ukrainian serviceman (born in 1979) was killed and another Ukrainian soldier was wounded in action in the Donbass region on 15 December. Pro-Russian officials at Donetsk city reported 17 Ukrainian violations of the ceasefire in 12 locations using small arms, heavy machine guns, snipers, automatic grenade launchers, antitank rocket launchers, 73 mm antitank recoilless rifles and 120 mm mortars. Sources from the self-proclaimed Luhansk People's Republic recorded four Ukrainian violations of the truce within the republic boundaries. The Ukrainian military used small arms, automatic grenade launchers, 73 mm antitank recoilless rifles, 82 mm and 120 mm mortars to attack pro-Russian forces at Zholobok, Kalynove, Smile and Donetskyi. The press-centre of the JFO reported in the evening that pro-Russian military had opened fire on positions of Ukrainian troops on 5 occasions, 82 mm mortars were employed at Vodiane. By the end of the day total 16 ceasefire violations were registered, two Ukrainian soldiers were wounded. Pro-Russian authorities from Donetsk city recorded several Ukrainian violations of the ceasefire by evening. Dokuchaievsk, Yasynuvata, Spartak, Vasiilivka, Oleksandrivka, Volvo Center, Staromariivka and Kruta Balka, in the outskirts of Donetsk city, and, in the region of Mariupol, Pikuzy, Uzhivka and Sakhanka, were attacked by Ukrainian forces. In the main incidents, BMP-1 armoured vehicles from Talakivka and Hnutove launched four major attacks on pro-Russian redoubts at Pikuzy. BMP-2 armoured vehicles from Kamianka and Mariivka opened fire with 30 mm cannons on pro-Russian positions at Staromariivka and Oleksandrivka. The spokesman of the Ukrainian operational headquarters reported in the morning, that pro-Russian troops had opened fire on 16 occasions on Ukrainian positions the previous day (including on 13 occasions in Donetsk region and on 3 occasions in Luhansk region); the fire was returned on several occasions. By noon of 17 December one ceasefire violation was registered with no casualties on the Ukrainian side. The spokesman of the Ministry of Defence confirmed at noon that two Ukrainian servicemen were wounded in action in the Donbass region on 16 December. Pro-Russian officials at Donetsk city recorded 17 Ukrainian violations of the ceasefire in 13 different locations using small arms, heavy machine guns, automatic grenade launchers, 73 mm antitank recoilless rifles, armoured personnel carriers and armoured fighting vehicles. Officials from the self-proclaimed Luhansk People's Republic recorded five Ukrainian violations of the truce within the republic boundaries. The Ukrainian military used heavy machine guns, 73 mm antitank recoilless rifles, 82 mm and 120 mm mortars to attack pro-Russian forces at Sentianivka, Kalynivka, Donetskyi and Smile. According to the information provided by the press-centre of the JFO in the evening, pro-Russian military had opened fire on positions of Ukrainian troops on 1 occasion, at Hnutove, in the morning. By the end of the day total 7 ceasefire violations were registered with no casualties on the Ukrainian side. A series of Ukrainian violations of the ceasefire were reported by pro-Russian authorities by evening. Kruta Balka, Spartak and Vasylivka, in the outskirts of Donetsk city, Zaitseve and Dolomitne, in the area of Horlivka, and, in the region of Mariupol, Sakhanka and Uzhivka came under hostile fire. In the main incidents, BMP-1 armoured vehicles from Novoluhanske and Avdiivka engaged pro-Russian positions at Dolomitne and Spartak, respectively. Spartak also became the target of 82 mm mortars and ZU-23-2 antiaircraft guns. According to the information provided by the spokesman of the Ukrainian operational headquarters in the morning, pro-Russian troops had opened fire on 7 occasions on Ukrainian positions the previous day (including on 5 occasions in Donetsk and twice in Luhansk region); the fire was returned on several occasions. By noon of 18 December four ceasefire violations were registered with no casualties on the Ukrainian side. The spokesman of the Ministry of Defence reported at noon no casualties in the Donbass region on 17 December. Pro-Russian officials at Donetsk city reported 22 Ukrainian violations of the ceasefire in eight locations using small arms, heavy machine guns, automatic grenade launchers, 73 mm antitank recoilless rifles, 82 mm mortars, antiaircraft guns, armoured personnel carriers and armoured fighting vehicles. Sources from the self-proclaimed Luhansk People's Republic recorded three Ukrainian violations of the truce within the republic boundaries. The Ukrainian military used 73 mm antitank recoilless rifles and 82 mm mortars to attack pro-Russian forces at Zholobok, Lohvynove and Zolote. The press-centre of the JFO reported in the evening that pro-Russian military had opened fire on positions of Ukrainian troops on 7 occasions. By the end of the day total 13 ceasefire violations were registered, one Ukrainian soldier was wounded. Pro-Russian sources told the press that Ukrainian forces had broken the ceasefire on several occasions by evening. Kruta Balka, Yasynuvata, Zhabicheve, Staromykhailivka, Trudivske and Spartak, in the outskirts of Donetsk city, Gagarin mining complex, in the area of Horlivka, and, in the region of Mariupol, Sakhanka, Uzhivka, Pikuzy and Novoshyrokivske, came under hostile fire. In the main incidents, 82 mm mortars landed in Spartak, while BMP-2 armoured vehicles from Avdiivka opened fire on pro-Russian positions at Yasynuvata. The spokesman of the Ukrainian operational headquarters reported in the morning, that pro-Russian troops had opened fire on 13 occasions on Ukrainian positions the previous day (including on 11 occasions in Donetsk region and on 2 occasions in Luhansk region); the fire was returned on 6 occasions. By noon of 19 December two ceasefire violations were registered with no casualties on the Ukrainian side. The spokesman of the Ministry of Defence confirmed at noon that one Ukrainian serviceman was wounded in the Donbass region on 18 December. Pro-Russian sources at Donetsk city reported 18 Ukrainian violations of the ceasefire in ten locations using small arms, heavy machine guns, automatic grenade launchers, 73 mm antitank recoilless rifles, 82 mm mortars, antiaircraft guns, armoured personnel carriers and armoured fighting vehicles. Authorities from the self-proclaimed Luhansk People's Republic recorded three Ukrainian violations of the truce within the republic boundaries. The Ukrainian military used small arms, automatic grenade launchers, 82 mm mortars and 120 mm mortars to engage pro-Russian forces at Zholobok. According to the information provided by the press-centre of the JFO in the evening, pro-Russian military had opened fire on positions of Ukrainian troops on 4 occasions – at Novotroitske and Novomykhailivka (in the area of Donetsk city), and at Chermalyk and Pavlopil (in the area of Mariupol). By the end of the day a total of 7 ceasefire violations were registered with no casualties on the Ukrainian side. In the area of Donetsk city and in the region of Mariupol, small arms and heavy machine guns were fired at Chermalyk, Novomykhailivka, Marinka and Krasnohorivka. Novotroitske became the target of 73 mm antitank recoilless rifles, while Pavlopil was shelled with automatic grenade launchers. Pro-Russian officials from Donetsk city told the press that Ukrainian forces had broken the ceasefire on several occasions by evening. Kruta Balka, Yasynuvata, Staromykhailivka, Dokuchaievsk, Trudivske and Oleksandrivka, in the outskirts of Donetsk city, Gagarin mining complex and Zaitseve, in the area of Horlivka, and, in the region of Mariupol, Sakhanka and Pikuzy, came under hostile fire. In the main incidents, 120 mm mortar rounds landed at Staromykhailivka. BMP-1 armoured vehicles from Dzezhinsky launched a sustained attack on Gagarin mining complex supported by small arms and heavy machine gun fire. BMP-2 armoured vehicles from Krasnohorivka opened fire on pro-Russian positions at Staromykhailivka. According to the information provided by the spokesman of the Ukrainian operational headquarters in the morning, pro-Russian troops had opened fire on 7 occasions on Ukrainian positions the previous day, exclusively in Donetsk region; the fire was not returned once. By noon of 20 December no ceasefire violations were registered. The spokesman of the Ministry of Defence reported at noon no casualties in the Donbass region on 19 December. Pro-Russian officials at Donetsk city reported 20 Ukrainian violations of the ceasefire in 12 locations using small arms, heavy machine guns, automatic grenade launchers, 73 mm antitank recoilless rifles, 120 mm mortars, armoured personnel carriers and armoured fighting vehicles. Sources from the self-proclaimed Luhansk People's Republic recorded three Ukrainian violations of the truce within the republic boundaries. The Ukrainian military used heavy machine guns, 73 mm antitank recoilless rifles, 82 mm mortars, 120 mm mortars and BMP-1 armoured vehicles to attack pro-Russian forces at Donetskyi, Zholobok and Lozove. The press-centre of the JFO reported in the evening, that pro-Russian military had opened fire on positions of Ukrainian troops on 3 occasions, one Ukrainian serviceman was wounded as a result. By the end of the day total 8 ceasefire violations were registered, one Ukrainian soldier was wounded. In the outskirts of Donetsk city and in the region of Mariupol, Vodiane became the target of 120 mm mortars, while 82 mm mortar rounds landed in Hnutove. Infantry weapons were used to harass Ukrainian troops at Lebedinske, Marinka and Krasnohorivka. In the northern sector of the demarcation line, pro-Russian and Ukrainian forces trade small arms fire in the southern area of Stanytsia Luhanska, while antitank rockets and 82 mm mortars hit Ukrainian positions at Luhanske. Pro-Russian authorities from Donetsk city recorded a series of Ukrainian violations of the truce throughout the day. The Ukrainian military opened fire on pro-Russian positions at Zhabicheve, Yasynuvata, Vasiilivka, Volvo Center, Spartak, Kruta Balka, Trudivske, Zhabicheve and Staromykhailivka, in the environs of Donetsk city, Zaitseve, in the area of Horlivka, and, in the region of Mariupol, Sakhanka and Uzhivka. Most incidents involved the use of infantry weapons and automatic grenade launchers. Zhabicheve, Uzhivka and Sakhanka were shelled with 120 mm mortars, while Spartak came under the combined fire of 73 mm antitank recoilless rifles and ZU-23-2 antiaircraft guns. Volvo Center also received fire from 73 mm antitank recoilless rifles. The spokesman of the Ukrainian operational headquarters reported in the morning, that pro-Russian troops had opened fire on 8 occasions on Ukrainian positions the previous day (including on 6 occasions in Donetsk region and twice in Luhansk region); the fire was returned on several occasions. By noon 21 December one ceasefire violation was registered with no casualties on the Ukrainian side. The spokesman of the Ministry of Defence reported confirmed at noon that one Ukrainian serviceman was wounded in action in the Donbass region on 20 December. Pro-Russian sources at Donetsk city reported 20 Ukrainian violations of the ceasefire in ten locations using small arms, heavy machine guns, automatic grenade launchers, 73 mm antitank recoilless rifles, 120 mm mortars and antiaircraft guns. In the course of the past week there were 144 Ukrainian violations aof the truce. Ukrainian forces fired 61 rounds from 82 mm and 120 mm mortars on the same period, and made widespread use of armoured fighting vehicles. Officials from the self-proclaimed Luhansk People's Republic recorded six Ukrainian violations of the truce within the republic boundaries. The Ukrainian military used small arms, heavy machine guns, antitank rocket launchers, 82 mm mortars, 120 mm mortars and BMP-1 armoured vehicles to engage pro-Russian positions at Zholobok, Smile, Kalynivka and Lohvynove. According to the information provided by the press-centre of the JFO in the evening, pro-Russian military had opened fire on positions of Ukrainian troops on 3 occasions. By the end of the day total 7 ceasefire violations were registered, with no casualties on the Ukrainian side. In the area around Donetsk city and in the region of Mariupol, pro-Russian forces fired small arms, heavy machine guns and grenade launchers at Ukrainian troops near Chermalyk, Novomykhailivka, Lebedinske and Hnutove. In the northern section of the demarcation line, Krymske was shelled with automatic grenade launchers, 82 mm mortars and 120 mm mortars. Novotoshkivke was also hit by 120 mm mortar rounds. Pro-Russian authorities from Donetsk city reported a series of Ukrainian violations of the ceasefire by evening. Trudivske, Spartak, Kruta Balka, Mineralne, Yasynuvata, and Volvo Center, in the surroundings of Donetsk city, Zaitseve and Gagarin mining complex, in the area of Horlivka, and, in the region of Mariupol, Uzhivka, Pikuzy and Novoshyrokivske, came under attack. Most incidents involved the use of infantry weapons and automatic grenade launchers. sakhanka was hit by 120 mm mortar volleys. Trudivske received fire from 73 mm antitank recoilless rifles. According to the information provided by the spokesman of the Ukrainian operational headquarters in the morning, pro-Russian troops had opened fire on 7 occasions on Ukrainian positions the previous day (including on 4 occasions in Donetsk region and on 3 occasions in Luhansk region); the fire was returned on several occasions. By noon of 22 December one ceasefire violation was registered, at Hnutove, at around 3:20 am. The spokesman of the Ministry of Defence reported at noon, for the third consecutive day, no casualties in the Donbass region during the previous day. Pro-Russian officials at Donetsk city reported 23 Ukrainian violations of the ceasefire in 12 locations using small arms, heavy machine guns, snipers, automatic grenade launchers, antitank rocket launchers, 73 mm antitank recoilless rifles and 120 mm mortars. Sources from the self-proclaimed Luhansk People's Republic recorded six Ukrainian violations of the truce within the republic boundaries. Ukrainian forces used small arms, heavy machine guns, antitank rocket launchers, 82 mm mortars, 120 mm mortars and BMP-1 armoured vehicles to engage pro-Russian positions at Sokolniki, Kalynivka, Zholobok and Donetskyi. The press-centre of the JFO reported in the evening no further ceasefire violations besides the one that took place at Hnutove at around 3:20 am. By the end of the day total 5 ceasefire violations were registered with no casualties on the Ukrainian side. In the surroundings of Donetsk city and in the region of Mariupol, Ukrainian troops at Chermalyk were harassed with small arms and heavy machine gun fire. Ukrainian positions near Vodiane were shelled with antitank rockets and 82 mm mortars. Hnutove and Krasnohorivka became the target of small arms and automatic grenade launchers. In the northern section of the demarcation line, small arms, heavy machine guns and automatic grenade launchers were fired at Ukrainian positions at Novotoshkivke. Pro-Russian sources told the press that Ukrainian forces had broken the ceasefire on several occasions by evening. Kruta Balka, Yasynuvata, Oleksandrivka, Zhabicheve, Trudivske, Staromykhailivka and Volvo Center, in the outskirts of Donetsk city, Gagarin mining complex and Shyroka Balka, in the area of Horlivka, and, in the region of Mariupol, Sakhanka and Uzhivka, came under hostile fire. In the main incidents, Ukrainian tanks from Vodiane engaged pro-Russian redoubts at Uzhivka, while BMP-1 armoured vehicles from Krasnohorivka launched a sustained attack on pro-Russian positions at Staromykhailivka. The area of Volvo Center came under intense fire from 73 mm antitank recoilless rifles, 82 mm mortars and 120 mm mortars; 82 mm mortar rounds also landed in Sakhanka. Zhabicheve received fire from ZU-23-2 antiaircarft guns. The spokesman of the Ukrainian operational headquarters reported in the morning, that pro-Russian troops had opened fire on 5 occasions on Ukrainian positions the previous day (including on 4 occasions in Donetsk and once in Luhansk region); the fire was returned twice. By morning of 23 December no ceasefire violations were registered. The spokesman of the Ministry of Defence reported at noon, for the fourth consecutive day, no casualties in the Donbass region during the previous day. Pro-Russian sources at Donetsk city reported 19 Ukrainian violations of the ceasefire in ten locations using small arms, heavy machine guns, automatic grenade launchers, 73 mm antitank recoilless rifles, 82 mm mortars, 120 mm mortars, antiaircraft guns, armoured personnel carriers, armoured fighting vehicles and tanks. Sources from the self-proclaimed Luhansk People's Republic recorded five Ukrainian violations of the truce within the republic boundaries. Ukrainian forces used heavy machine guns, snipers, automatic grenade launchers, 82 mm mortars and BMP-1 armoured vehicles to engage pro-Russian positions at Sokolniki, Donetskyi and Smile. According to the information provided by the press-centre of the JFO in the evening, by 6:00 pm no ceasefire violations were registered. By the end of the day no ceasefire violations were registered by the Ukrainian side. A series of Ukrainian violations of the ceasefire were reported by pro-Russian authorities by evening. Kruta Balka, Vesele, Volvo Center, Zhabicheve, Yasynuvata and Oleksandrivka, in the outskirts of Donetsk city, Zaitseve and Gagarin mining complex, in the area of Horlivka, and, Sakhanka, in the region of Mariupol, came under hostile fire. In the main incidents, BMP-2 armoured vehicles from Pisky opened fire on Volvo Center, supported by 82 mm mortar fire, while BMP-1 armoured vehicles from Shumy engaged pro-Russian positions at Gagarin. ZU-23-2 antiaircraft guns and 82 mm mortars were fired at Zhabicheve. According to the information provided by the spokesman of the Ukrainian operational headquarters in the morning, no ceasefire violations were registered on 23 December. By noon of 24 December seven ceasefire violations were was registered – twice in Luhansk region, at Novooleksandrivka and Kriakivka, and at Pisky, Kamianka, Vodiane, and Taramchuk in Donetsk region; the fire was returned on 3 occasions, no casualties were reported. The spokesman of the Ministry of Defence reported at noon no casualties in the Donbass region on 23 December. Pro-Russian officials at Donetsk city reported 18 Ukrainian violations of the ceasefire in eight locations using small arms, heavy machine guns, automatic grenade launchers, 73 mm antitank recoilless rifles, 82 mm mortars, antiaircraft guns, armoured personnel carriers and armoured fighting vehicles. Officials from the self-proclaimed Luhansk People's Republic recorded three Ukrainian violations of the truce within the republic boundaries. The Ukrainian military used small arms, heavy machine guns and 82 mm mortars to attack pro-Russian forces at Krasnyi Yar, Lohvynove and Sokolniki. The press-centre of the JFO reported in the evening that by 6:00 pm pro-Russian military had opened fire on positions of Ukrainian troops on 11 occasions, one Ukrainian serviceman was wounded. By the end of the day total 20 ceasefire violations were registered, two more Ukrainian soldiers were wounded. In the surroundings of Donetsk city and in the region of Mariupol, 120 mm mortar rounds landed in Pisky, while 82 mm mortar fire hit Hnutove and Vodiane. Infantry weapons and grenade launchers were used to harass Ukrainian troops at Pisky, Kamianka, Taramchuk, Vodiane, Hnutove and Chermalyk. In the northern sector of the demarcation line, Krymske was shelld with 82 mm and 120 mm mortars, while 82 mm mortars rounds landed in Kryakivka. Pro-Russian sources from Donetsk city told the press that Ukrainian forces had broken the ceasefire on several occasions by evening. Volvo Center, Vasiilivka, Trudiivske, Oleksandrivka, Yasynuvata, Spartak and Staromykhailivka, in the outskirts of Donetsk city, Zaitseve, in the area of Horlivka, and, in the region of Mariupol, Sakhanka and Pikuzy, came under fire. In the main incidents, Ukrainian tanks from Kamianka launched an intense attack on pro-Russian redoubts at Vasiilivka, supported by 82 mm mortars, 120 mm mortars and BMP-1 armoured vehicles. Zaitseve, Sakhanka and Pikuzy, meanwhile, were shelled with 120 mm mortars. BMP-2 armoured vehicles from Pisky opened fire on pro-Russian positions at Volvo Center with 30 mm gunfire. The spokesman of the Ukrainian operational headquarters reported in the morning, that pro-Russian troops had opened fire on 20 occasions on Ukrainian positions the previous day (including on 14 occasions in Donetsk region and on 6 occasions in Luhansk region); the fire was returned on several occasions. By noon of 25 December no ceasefire violations were registered. The spokesman of the Ministry of Defence confirmed at noon that three Ukrainian servicemen were wounded in action in the Donbass region on 24 December. Pro-Russian officials at Donetsk city reported 22 Ukrainian violations of the ceasefire in six locations using small arms, heavy machine guns, automatic grenade launchers, antitank rocket launchers, 73 mm antitank recoilless rifles, 82 mm mortars, 120 mm mortars, armoured personnel carriers, armoured fighting vehicles and tanks. Sources from the self-proclaimed Luhansk People's Republic recorded eight Ukrainian violations of the truce within the republic boundaries. Ukrainian forces used small arms, heavy machine guns, automatic grenade launchers, 82 mm mortars, 120 mm mortars, BMP-1 armoured vehicles, 122 mm and 152 mm self-propelled artillery to attack pro-Russian positions at Sokolniki, Lohvynove, Zholobok, Kalynivka and Sentianivka. Heavy shelling was reported at Sentianivka, which became the target of 120 mm mortars, 122 mm and 152 mm self-propelled artillery. BMP-1 armoured vehicles from Luhanske engaged pro-Russian forces at Lohvynove and Kalynivka. According to the information provided by the press-centre of the JFO in the evening, by 6:00 pm pro-Russian military had opened fire on positions of Ukrainian troops on 3 occasions, one Ukrainian soldier was wounded. By the end of the day a total of 5 ceasefire violations were registered. In the area around Doentsk city, pro-Russian forces attacked Avdiivka with small arms and antitank rocket launchers. In the northern sector of the demarcation line, Krymske came under the combined fire of 82 mm and 120 mm mortars; Zolote was meanwhile hit by 82 mm mortar rounds. Ukrainian troops at Novotoshkivke were harassed with small arms and heavy machine gun fire. Small arms fire was reported at Stanytsia Luhanska. According to the information provided by the spokesman of the Ukrainian operational headquarters in the morning, pro-Russian troops had opened fire on 5 occasions on Ukrainian positions the previous day (including once in Donetsk region and on 4 occasions in Luhansk region); the fire was returned on several occasions. By noon of 26 December one ceasefire violation was registered, with no casualties on the Ukrainian side. The spokesman of the Ministry of Defence confirmed at noon that one Ukrainian serviceman was wounded in action in the Donbass region on 25 December. Pro-Russian sources at Donetsk city reported 18 Ukrainian violations of the ceasefire in ten locations using small arms, heavy machine guns, automatic grenade launchers, 73 mm antitank recoilless rifles, armoured personnel carriers and armoured fighting vehicles. Officials from the self-proclaimed Luhansk People's Republic recorded three Ukrainian violations of the truce within the republic boundaries. The Ukrainian military used heavy machine guns, 73 mm antitank recoilless rifles and 82 mm mortars to engage pro-Russian positions at Zholobok, Donetskyi and Lozove. The press-centre of the JFO reported in the evening that as of 6:00 pm pro-Russian military had opened fire on positions of Ukrainian troops on 5 occasions. By the end of the day total 7 ceasefire violations were registered with no casualties on the Ukrainian side. In the area of Donetsk city and in the region of Mariupol, Hnutove was shelled with antitank rocket launchers and 82 mm mortars. Pisky and Krasnohorivka were targeted with small arms and automatic grenade launchers. In the northern sector of the demarcation line, Luhanske received fire from 73 mm antitank recoilless rifles. Pro-Russian sources told the press that Ukrainian forces had broken the ceasefire on several occasions by evening. Kruta Balka, Yasynuvata and Volvo Center, in the outskirts of Donetsk city, Zaitseve and Gagarin mining complex, in the area of Horlivka, and, in the region of Mariupol, Sakhanka and Uzhivka, came under hostile fire. Most incidents involved the use of infantry weapons and automatic grenade launchers. Volvo Center was shelled with 120 mm mortars. Volvo Center, Sakhanka, Zaitseve and Uzhivka became the target of 73 mm antitank recoilless rifles. The spokesman of the Ukrainian operational headquarters reported in the morning, that pro-Russian troops had opened fire on 7 occasions on Ukrainian positions the previous day (including on 6 occasions in Donetsk and on 1 occasion in Luhansk region); the fire was returned on 3 occasions. By morning of 27 December (as of 11:00 am) one ceasefire violation was registered with no casualties on the Ukrainian side. The spokesman of the Ministry of Defence reported at noon no casualties in the Donbass region on 26 December. Pro-Russian officials at Donetsk city reported 23 Ukrainian violations of the ceasefire in nine locations using small arms, heavy machine guns, automatic grenade launchers, antitank rocket launchers, 73 mm antitank recoilless rifles, 82 mm and 120 mm mortars. Local sources from the self-proclaimed Luhansk People's Republic recorded two Ukrainian violations of the truce within the republic borders. Donetskyi was hit by a single 120 mm mortar round and small arms fire, while pro-Russian troops at Knyaz Igor memorial where harassed with small arms fire. According to the information provided by the press-centre of the JFO in the evening, as of 6:00 pm pro-Russian military had opened fire on positions of Ukrainian troops on 3 occasions. By the end of the day total 8 ceasefire violations were registered, one Ukrainian soldier was wounded as a result. In the area of Donetsk city and in the region of Mariupol, 82 mm and 120 mm mortars were fired at Pisky and Hnutove. infantry weapons and automatic grenade launchers were fired at Pyshchevik, Avdiivka and Vodiane. In the northern secton of the demarcation line, small arms fire was reported at Novozvanivka, and 82 mm mortar fire hit Krymske. A series of Ukrainian violations of the ceasefire were reported by pro-Russian authorities by evening. Pro-Russian forces attacked Volvo Center, Trudivske, Zhabicheve, Yasynuvata, Staromykhailivka, Spartak and Kruta Balka, in the outskirts of Donetsk city, Zaitseve, in the area of Horlivka, and, in the region of Mariupol, Sakhanka, Ukraiinske, Uzhivka and Novoshyrokivske. Most incidents involved the use of infantry weapons, automatic grenade launchers and antitank rockets. Volvo Center was hit by 120 mm mortar fire. Later in the night, BMP-2 armoured vehicles from Krasnohorivka engaged Pro-Russian positions at Staromykhailivka. All parties agreed in Minsk on a new ceasefire to begin in principle on the first hour of 29 December, and should last for 10 days. According to the information provided by the spokesman of the Ukrainian operational headquarters in the morning, pro-Russian troops had opened fire on 8 occasions on Ukrainian positions the previous day (including on 6 occasions in Donetsk region and twice in Luhansk region); the fire was returned on several occasions. By noon of 28 December two ceasefire violations were registered. The spokesman of the Ministry of Defence confirmed at noon that one Ukrainian serviceman was wounded in action in the Donbass region on 27 December. Pro-Russian sources at Donetsk city reported 20 Ukrainian violations of the ceasefire in 12 locations using small arms, heavy machine guns, automatic grenade launchers, 73 mm antitank recoilless rifles, 82 mm mortars, 120 mm mortars, armoured personnel carriers and armoured fighting vehicles. Pro-Russian authorities at Donetsk city reported 18 Ukrainian violations of the ceasefire in ten locations using small arms, heavy machine guns, automatic grenade launchers, 73 mm antitank recoilless rifles, armoured personnel carriers and armoured fighting vehicles. The same sources said that Ukrainian forces had broken the ceasefire 136 times over the past week. The Ukrainian military fired 70 rounds from 82 mm and 120 mm mortars. They also made widespread use of armoured fighting vehicles. Officials from the self-proclaimed Luhansk People's Republic recorded four Ukrainian violations of the truce within the republic boundaries. The Ukrainian military used heavy machine guns, antitank rocket launchers and 82 mm mortars to attack pro-Russian positions at Smile, Lozove, Molodezhne and Sentianivka. The press-centre of the JFO reported in the evening that by 6:00 pm pro-Russian military had opened fire on positions of Ukrainian troops on 6 occasions, Novotoshkivske and Hnutove were under 82 mm mortars fire, one Ukrainian soldier was wounded. By the end of the day total 11 ceasefire violations were registered. In the surroundings of Donetsk city and in the region of Mariupol, Hnutove was hit by 82 mm mortar rounds. Slavne, Taramchuk, Pisky, Opytne, Pavlopil, Hnutove and Vodiane became the target of infantry weapons and antitank rocket launchers. In the northern section of the demarcation line, Novotoshkivke was shelled with 82 mm mortars, while Bolotenne was fired at from automatic grenade launchers. Pro-Russian sources from Donetsk city told the press that Ukrainian forces had broken the ceasefire on several occasions by evening. Staromykhailivka, Dokuchaievsk, and Volvo Center, in the surroundings of Donetsk city, Zaitseve and Gagarin mining complex, in the area of Horlivka, and, in the region of Mariupol, Sakhanka and Pikuzy, came under hostile fire. In the main incidents, BMP-1 armoured vehicles from Krasnohorivka launched a sustained attack on pro-Russian redoubts at Staromykhailivka. ZU-23-2 antiaircraft guns were fired at Volvo Center, while Pikuzy and Volvo Center received fire from 73 mm antitank recoilless rifles. The spokesman of the Ukrainian operational headquarters reported in the morning, that pro-Russian troops had opened fire on 11 occasions on Ukrainian positions the previous day (including on 8 occasions in Donetsk and on 3 occasions in Luhansk region); the fire was returned on 4 occasions. By morning of 29 December (as of 11:00 am) one ceasefire violation was registered. The spokesman of the Ministry of Defence confirmed at noon that one Ukrainian serviceman was wounded in the Donbass region on 28 December. Pro-Russian authorities at Donetsk city reported 17 Ukrainian violations of the ceasefire in nine locations using small arms, heavy machine guns, automatic grenade launchers, 73 mm antitank recoilless rifles, antiaircraft guns, armoured personnel carriers and armoured fighting vehicles. According to local sources, Ukrainian forces broke the ceasefire twice within the borders of the self-styled Luhansk People's Republic. The Ukrainian military employed small arms and BMP-2 armoured vehicles to engage pro-Russian positions at Nikolaevka and Veselehorivka. According to the information provided by the press-centre of the JFO in the evening, as of 6:00 pm pro-Russian military had opened fire on positions of Ukrainian troops twice. By the end of the day total 6 ceasefire violations were registered, with no casualties on the Ukrainian side. In the area around Donetsk city and in the region of Mariupol, Novomykhailivka and Vodiane were repeatedly attacked with infantry weapons and automatic grenade launchers, while rounds from 73 mm antitank recoilless rifles hit Hnutove. Ukrainian troops at Opytne were harassed with small arms and heavy machine gun fire. In the northern sector of the demarcation line, antitank rockets landed in area of Zalizne. A number of Ukrainian violations of the fresh ceasefire agreement were reported by pro-Russian authorities at Donetsk city during the evening. Ukrainian forces engaged pro-Russian forces at Zhabicheve, in the outskirts of Donetsk city, and Uzhivka, in the region of Mariupol. Zhabicheve became the target of infantry weapons, automatic grenade launchers, 120 mm mortars and antiaircraft guns. Small arms and heavy machine gun fire was reported at Uzhivka, which was later shelled with automatic grenade launchers. According to the information provided by the spokesman of the Ukrainian operational headquarters in the morning, pro-Russian troops had opened fire on 6 occasions on Ukrainian positions the previous day (including on 5 occasions in Donetsk and once in Luhansk region); the fire was returned on half of the occasions. By noon of 30 December no ceasefire violations were registered. The spokesman of the Ministry of Defence reported at noon no casualties in the Donbass region on 29 December. Pro-Russian authorities at Donetsk city reported four Ukrainian violations of the ceasefire in two locations using small arms, heavy machine guns, automatic grenade launchers, 73 mm antitank recoilless rifles, 120 mm mortars and antiaircraft guns. Sources from the self-proclaimed Luhansk People's Republic recorded three Ukrainian violations of the truce within the republic boundaries. The Ukrainian military used small arms fire, heavy machine gun fire and antitank rockets to harass pro-Russian positions at Zholobok and Donetskyi. The press-centre of the JFO reported in the evening that as of 6:00 pm pro-Russian military had opened fire on positions of Ukrainian troops once, when BMP-2 armoured vehicles engaged Ukrainian forces at Novotoshkivske, at about 50 km WNW from Luhansk. Sometime later Ukrainian positions at Vodiane, near Mariupol, were attacked with small arms and grenade launchers; that brought the total number of ceasefire violations on 30 December to two; with no casualties on the Ukrainian side. Pro-Russian officials from Donetsk city said that Ukrainian forces fired infantry weapons, automatic grenade launchers and 82 mm mortars at pro-Russian positions around Spartak. The spokesman of the Ukrainian operational headquarters reported in the morning, that pro-Russian troops had opened fire on 2 occasions on Ukrainian positions the previous day (once in Donetsk and once in Luhansk region). By morning of 31 December (as of 11:00 am) three ceasefire violations were registered, two Ukrainian soldiers were wounded as a result. The spokesman of the Ministry of Defence reported at noon no casualties in the Donbass region on 30 December. Pro-Russian officials at Donetsk city reported that Ukrainian forces attacked Spartak using small arms, automatic grenade launchers and 82 mm mortars. Local sources from the self-proclaimed Luhansk People's Republic recorded three Ukrainian violations of the truce within the republic borders. Ukrainian forces engaged pro-Russian positions at Donetskyi and Smile using small arms, heavy machine guns, 73 mm antitank recoilless rifles, 82 mm and 120 mm mortars. According to the information provided by the press-centre of the JFO in the evening, no further ceasefire violations or casualties were registered by 6:00 pm. By the end of the day total 4 ceasefire violations were registered with no further casualties on the Ukrainian side. In the area of Donetsk city and in the region of Mariupol, Oleksandrivka came under 82 mm mortar fire. In the northern sector of the demarcation line, 120 mm mortar rounds landed in Novotoshkivke, while Krymske was shelled from rocket launchers and 82 mm mortars. ^ "Зведення щодо обстановки в районі проведення операції Об'єднаних сил станом на 07:00 1 грудня 2018 року" (in Ukrainian). MoD. 1 December 2018. Retrieved 1 December 2018. ^ "За сутки ВФУ применили по территории Республики 90 боеприпасов - СЦКК". 1 December 2018. Retrieved 1 December 2018. ^ "Оперативная сводка за сутки с 30 ноября на 01 декабря". Народная милиция ЛНР | Официальный сайт (in Russian). Retrieved 1 December 2018. ^ "Зведення щодо обстановки в районі проведення операції Об'єднаних сил станом на 18:00 1 грудня 2018 року" (in Ukrainian). MoD. 1 December 2018. Retrieved 1 December 2018. ^ a b "Зведення щодо обстановки в районі проведення операції Об'єднаних сил станом на 07:00 2 грудня 2018 року" (in Ukrainian). MoD. 2 December 2018. Retrieved 2 December 2018. ^ "ВФУ обстреляли Донецк, Ясиноватую и ряд населенных пунктов - СЦКК". 2 December 2018. Retrieved 2 December 2018. ^ "Оперативная сводка за сутки с 01 на 02 декабря". Народная милиция ЛНР | Официальный сайт (in Russian). Retrieved 2 December 2018. ^ "Зведення щодо обстановки в районі проведення операції Об'єднаних сил станом на 18:00 2 грудня 2018 року" (in Ukrainian). MoD. 2 December 2018. Retrieved 2 December 2018. ^ a b "Зведення щодо обстановки в районі проведення операції Об'єднаних сил станом на 07:00 3 грудня 2018 року" (in Ukrainian). MoD. 3 December 2018. Retrieved 3 December 2018. ^ a b c d "Situation Update, east of Ukraine as of morning, December 03, 2018". MoD. 3 December 2018. Retrieved 3 December 2018. ^ "Украинские боевики обстреляли районы 11 населенных пунктов Республики, есть повреждения". 3 December 2018. Retrieved 3 December 2018. ^ a b "Луганский Информационный Центр — Народная милиция ЛНР сбила направлявшийся к Луганску ударный беспилотник ВСУ (ФОТО)". lug-info.com. Retrieved 16 December 2018. ^ a b c "Брифінг Міноборони України щодо обстановки в районі проведення операції Об'єднаних сил" (in Ukrainian). MoD. 3 December 2018. Retrieved 3 December 2018. ^ "За сутки ВФУ применили по территории Республики более 180 боеприпасов - СЦКК". 3 December 2018. Retrieved 3 December 2018. ^ 24, Донецк. "Оперативная сводка за сутки с 2 на 3 декабря от НМ ЛНР". Донецк 24 (in Russian). Retrieved 3 December 2018. ^ "Зведення щодо обстановки в районі проведення операції Об'єднаних сил станом на 18:00 03 грудня 2018 року" (in Ukrainian). MoD. 3 December 2018. Retrieved 3 December 2018. ^ a b "Зведення щодо обстановки в районі проведення операції Об'єднаних сил станом на 07:00 4 грудня 2018 року" (in Ukrainian). MoD. 4 December 2018. Retrieved 4 December 2018. ^ a b "Situation Update, east of Ukraine as of morning, December 04, 2018". MoD. 4 December 2018. Retrieved 4 December 2018. ^ "В зоне обстрела ВФУ оказались Озеряновка, Спартак, Вольво-центр, поселок шахты "Трудовская", Александровка, Ленинское, Саханка - СЦКК". 4 December 2018. Retrieved 4 December 2018. ^ Донецк 24. "Оперативная сводка за сутки с 3 на 4 декабря от НМ ЛНР". Донецк 24 (in Russian). Retrieved 5 December 2018. ^ "Зведення щодо обстановки в районі проведення операції Об'єднаних сил станом на 18:00 04 грудня 2018 року" (in Ukrainian). MoD. 4 December 2018. Retrieved 4 December 2018. ^ a b "Зведення щодо обстановки в районі проведення операції Об'єднаних сил станом на 07:00 5 грудня 2018 року" (in Ukrainian). MoD. 5 December 2018. Retrieved 5 December 2018. ^ a b "Situation Update, east of Ukraine as of morning, December 05, 2018". MoD. 5 December 2018. Retrieved 5 December 2018. ^ "ВФУ обстреляли территорию Республики по трем направлениям - СЦКК". 5 December 2018. Retrieved 5 December 2018. ^ "Оперативная сводка за сутки с 4 на 5 декабря". Народная милиция ЛНР | Официальный сайт (in Russian). Retrieved 6 December 2018. ^ "Операція об'єднаних сил / Joint forces operation | Зведення станом на 18:00 5 грудня 2018 року" (in Ukrainian). Press-centre of the JFO HQ. 5 December 2018. Retrieved 5 December 2018. ^ a b "Зведення щодо обстановки в районі проведення операції Об'єднаних сил станом на 07:00 6 грудня 2018 року" (in Ukrainian). MoD. 6 December 2018. Retrieved 6 December 2018. ^ "ВФУ обстреляли ряд населенных пунктов ДНР по всем направлениям, ранена женщина - СЦКК". 6 December 2018. Retrieved 6 December 2018. ^ "Оперативная сводка за сутки с 5 на 6 декабря". Народная милиция ЛНР | Официальный сайт (in Russian). Retrieved 6 December 2018. ^ "Зведення щодо обстановки в районі проведення операції Об'єднаних сил станом на 18:00 06 грудня 2018 року" (in Ukrainian). MoD. 6 December 2018. Retrieved 6 December 2018. ^ a b "Зведення щодо обстановки в районі проведення операції Об'єднаних сил станом на 07:00 7 грудня 2018 року" (in Ukrainian). MoD. 7 December 2018. Retrieved 7 December 2018. ^ a b "Situation Update, east of Ukraine as of morning, December 07, 2018". MoD. 7 December 2018. Retrieved 7 December 2018. ^ "Militants launched six attacks on Ukrainian troops in Donbas in last day". Ukrinform. 7 December 2018. Retrieved 7 December 2018. ^ "ВФУ обстреляли территорию Республики по трем направлениям, выпущено порядка двухсот боеприпасов - СЦКК". 7 December 2018. ^ "Оперативная сводка за сутки с 6 на 7 декабря". Народная милиция ЛНР | Официальный сайт (in Russian). Retrieved 7 December 2018. ^ "Зведення щодо обстановки в районі проведення операції Об'єднаних сил станом на 18:00 7 грудня 2018 року" (in Ukrainian). MoD. 7 December 2018. Retrieved 7 December 2018. ^ a b "Зведення щодо обстановки в районі проведення операції Об'єднаних сил станом на 07:00 8 грудня 2018 року" (in Ukrainian). MoD. 8 December 2018. Retrieved 8 December 2018. ^ "Militants launched 13 attacks on Ukrainian troops in Donbas in last day". Ukrinform. 8 December 2018. Retrieved 8 December 2018. ^ "ВФУ обстреляли ряд населенных пунктов ДНР по всем направлениям, ранена женщина - СЦКК". 8 December 2018. Retrieved 8 December 2018. ^ "Оперативная сводка за сутки с 7 на 8 декабря". Народная милиция ЛНР | Официальный сайт (in Russian). Retrieved 9 December 2018. ^ "Зведення щодо обстановки в районі проведення операції Об'єднаних сил станом на 18:00 8 грудня 2018 року" (in Ukrainian). MoD. 8 December 2018. Retrieved 8 December 2018. ^ a b "Зведення щодо обстановки в районі проведення операції Об'єднаних сил станом на 07:00 9 грудня 2018 року" (in Ukrainian). MoD. 9 December 2018. Retrieved 9 December 2018. ^ "ВФУ обстреляли территорию Республики по трем направлениям, выпущено порядка двухсот боеприпасов - СЦКК". 9 December 2018. Retrieved 9 December 2018. ^ "Оперативная сводка за сутки с 8 на 9 декабря". Народная милиция ЛНР | Официальный сайт (in Russian). Retrieved 9 December 2018. ^ "Зведення щодо обстановки в районі проведення операції Об'єднаних сил станом на 18:00 9 грудня 2018 року" (in Ukrainian). MoD. 9 December 2018. Retrieved 9 December 2018. ^ a b "Зведення щодо обстановки в районі проведення операції Об'єднаних сил станом на 07:00 10 грудня 2018 року" (in Ukrainian). MoD. 10 December 2018. Retrieved 10 December 2018. ^ "Militants launched 14 attacks on Ukrainian troops in Donbas in last day". Ukrinform. 10 December 2018. Retrieved 10 December 2018. ^ "За сутки ВФУ применили по территории Республики около 170 боеприпасов - СЦКК". 10 December 2018. Retrieved 10 December 2018. ^ "Оперативная сводка за сутки с 9 на 10 декабря". Народная милиция ЛНР | Официальный сайт (in Russian). Retrieved 10 December 2018. ^ "Зведення щодо обстановки в районі проведення операції Об'єднаних сил станом на 18:00 10 грудня 2018 року" (in Ukrainian). MoD. 10 December 2018. Retrieved 10 December 2018. ^ a b "Зведення щодо обстановки в районі проведення операції Об'єднаних сил станом на 07:00 11 грудня 2018 року" (in Ukrainian). MoD. 11 December 2018. Retrieved 11 December 2018. ^ "Militants launched 12 attacks on Ukrainian troops in Donbas in last day". Ukrinform. 11 December 2018. Retrieved 11 December 2018. ^ "Situation Update, east of Ukraine as of morning, December 11, 2018". MoD. 12 December 2018. Retrieved 12 December 2018. ^ a b "Situation Update, east of Ukraine as of morning, December 11, 2018". MoD. 11 December 2018. Retrieved 11 December 2018. ^ Донецк 24. "Сводка нарушений режима прекращения огня с 10 по 11 декабря - СЦКК". Донецк 24 (in Russian). Retrieved 11 December 2018. ^ "Оперативная сводка за сутки с 10 на 11 декабря". Народная милиция ЛНР | Официальный сайт (in Russian). Retrieved 11 December 2018. ^ "Зведення щодо обстановки в районі проведення операції Об'єднаних сил станом на 18:00 11 грудня 2018 року" (in Ukrainian). MoD. 11 December 2018. Retrieved 11 December 2018. ^ a b "Зведення щодо обстановки в районі проведення операції Об'єднаних сил станом на 07:00 12 грудня 2018 року" (in Ukrainian). MoD. 12 December 2018. Retrieved 12 December 2018. ^ "ВФУ обстреляли территорию Республики по трем направлениям - СЦКК". 12 December 2018. Retrieved 12 December 2018. ^ "Оперативная сводка за сутки с 11 на 12 декабря". 12 December 2018. Retrieved 12 December 2018. ^ "Зведення щодо обстановки в районі проведення операції Об'єднаних сил станом на 18:00 12 грудня 2018 року" (in Ukrainian). MoD. 12 December 2018. Retrieved 12 December 2018. ^ a b "Зведення щодо обстановки в районі проведення операції Об'єднаних сил станом на 07:00 13 грудня 2018 року" (in Ukrainian). MoD. 13 December 2018. Retrieved 13 December 2018. ^ "Militants launched 7 attacks on Ukrainian troops in Donbas in last day". Ukrinform. 13 December 2018. Retrieved 13 December 2018. ^ "За сутки ВФУ применили свыше двухсот единиц боеприпасов - СЦК". 13 December 2018. Retrieved 13 December 2018. ^ "Оперативная сводка за сутки с 12 на 13 декабря". 13 December 2018. Retrieved 13 December 2018. ^ "Зведення щодо обстановки в районі проведення операції Об'єднаних сил станом на 18:00 13 грудня 2018 року" (in Ukrainian). MoD. 13 December 2018. Retrieved 13 December 2018. ^ a b "Зведення щодо обстановки в районі проведення операції Об'єднаних сил станом на 07:00 14 грудня 2018 року" (in Ukrainian). MoD. 14 December 2018. Retrieved 14 December 2018. ^ "Militants launched 22 attacks on Ukrainian troops in Donbas in last day". Ukrinform. 14 December 2018. Retrieved 14 December 2018. ^ a b "Situation Update, east of Ukraine as of morning, December 14, 2018". MoD. 14 December 2018. Retrieved 15 December 2018. ^ "Военнослужащие ЛНР сбили беспилотник ВСУ в районе Логвиново". News Front - Новостной Фронт. Новости Мира России Украины (in Russian). Retrieved 16 December 2018. ^ Донецк 24. "Сводка нарушений режима прекращения огня с 13 по 14 декабря - СЦКК". Донецк 24 (in Russian). Retrieved 14 December 2018. ^ "Всего за неделю зафиксировано сто сорок фактов нарушения режима прекращения огня украинскими боевиками – Эдуард Басурин / A total of one hundred and forty cease-fire violations by the Ukrainian militants were recorded this week – Eduard Basurin". 14 December 2018. Retrieved 15 December 2018. ^ Донецк 24. "Оперативная сводка за сутки с 13 на 14 декабря от НМ ЛНР". Донецк 24 (in Russian). Retrieved 14 December 2018. ^ "ведення щодо обстановки в районі проведення операції Об'єднаних сил станом на 18:00 14 грудня 2018 року" (in Ukrainian). MoD. 14 December 2018. Retrieved 14 December 2018. ^ a b c "Зведення щодо обстановки в районі проведення операції Об'єднаних сил станом на 07:00 15 грудня 2018 року" (in Ukrainian). MoD. 15 December 2018. Retrieved 15 December 2018. ^ "Militants launched 10 attacks on Ukrainian troops in Donbas in last day". Ukrinform. 15 December 2018. Retrieved 15 December 2018. ^ "За сутки ВФУ применили по территории Республики более 300 боеприпасов - СЦКК". 15 December 2018. Retrieved 15 December 2018. ^ "Оперативная сводка за сутки с 14 на 15 декабря". Народная милиция ЛНР | Официальный сайт (in Russian). Retrieved 15 December 2018. ^ "Зведення щодо обстановки в районі проведення операції Об'єднаних сил станом на 18:00 15 грудня 2018 року" (in Ukrainian). MoD. 15 December 2018. Retrieved 15 December 2018. ^ a b "Зведення щодо обстановки в районі проведення операції Об'єднаних сил станом на 07:00 16 грудня 2018 року" (in Ukrainian). MoD. 16 December 2018. Retrieved 16 December 2018. ^ "ВФУ семнадцать раз нарушили режим прекращения огня - СЦКК". 16 December 2018. Retrieved 16 December 2018. ^ "Оперативная сводка за сутки с 15 на 16 декабря". Народная милиция ЛНР | Официальный сайт (in Russian). Retrieved 16 December 2018. ^ "Зведення щодо обстановки в районі проведення операції Об'єднаних сил станом на 18:00 16 грудня 2018 року" (in Ukrainian). MoD. 16 December 2018. Retrieved 16 December 2018. ^ a b "Зведення щодо обстановки в районі проведення операції Об'єднаних сил станом на 07:00 17 грудня 2018 року" (in Ukrainian). MoD. 17 December 2018. Retrieved 17 December 2018. ^ "Militants launched 16 attacks on Ukrainian troops in Donbas in last day". Ukrinform. 17 December 2018. Retrieved 17 December 2018. ^ Донецк 24. "Сводка нарушений режима прекращения огня с 16 по 17 декабря - СЦКК". Донецк 24 (in Russian). Retrieved 18 December 2018. ^ "Оперативная сводка за сутки с 16 на 17 декабря". Народная милиция ЛНР | Официальный сайт (in Russian). Retrieved 18 December 2018. ^ "Зведення щодо обстановки в районі проведення операції Об'єднаних сил станом на 18:00 17 грудня 2018 року" (in Ukrainian). MoD. 17 December 2018. Retrieved 17 December 2018. ^ a b "Зведення щодо обстановки в районі проведення операції Об'єднаних сил станом на 07:00 18 грудня 2018 року" (in Ukrainian). MoD. 18 December 2018. Retrieved 18 December 2018. ^ "Militants launched seven attacks on Ukrainian troops in Donbas in last day". Ukrinform. 18 December 2018. Retrieved 18 December 2018. ^ "ВФУ обстреляли территорию Республики по трем направлениям - СЦКК". 18 December 2018. Retrieved 18 December 2018. ^ "Оперативная сводка за сутки с 17 на 18 декабря". Народная милиция ЛНР | Официальный сайт (in Russian). Retrieved 18 December 2018. ^ "ведення щодо обстановки в районі проведення операції Об'єднаних сил станом на 18:00 18 грудня 2018 року" (in Ukrainian). MoD. 18 December 2018. Retrieved 18 December 2018. ...обстріли з артилерії калібру 152 мм та з мінометів калібру 120 мм по позиціях Об’єднаних сил в районі населеного пункту Новотошківське на Луганському напрямку. ^ "Зведення щодо обстановки в районі проведення операції Об'єднаних сил станом на 07:00 19 грудня 2018 року" (in Ukrainian). MoD. 19 December 2018. Retrieved 19 December 2018. ^ "Militants launched 13 attacks on Ukrainian troops in Donbas in last day". Ukrinform. 19 December 2018. Retrieved 19 December 2018. ^ Донецк 24. "Сводка нарушений режима прекращения огня с 18 по 19 декабря - СЦКК". Донецк 24 (in Russian). Retrieved 19 December 2018. ^ Донецк 24. "Оперативная сводка за сутки с 18 на 19 декабря от НМ ЛНР". Донецк 24 (in Russian). Retrieved 20 December 2018. ^ "Зведення щодо обстановки в районі проведення операції Об'єднаних сил станом на 18:00 19 грудня 2018 року" (in Ukrainian). MoD. 19 December 2018. Retrieved 19 December 2018. ^ a b "Зведення щодо обстановки в районі проведення операції Об'єднаних сил станом на 07:00 20 грудня 2018 року" (in Ukrainian). MoD. 20 December 2018. Retrieved 20 December 2018. ^ "Militants launched seven attacks on Ukrainian troops in Donbas in last day". Ukrinform. 20 December 2018. Retrieved 20 December 2018. ^ "ВФУ обстреляли территорию Республики по трем направлениям, применив около трехсот единиц боеприпасов - СЦКК". 20 December 2018. Retrieved 20 December 2018. ^ Донецк 24. "Оперативная сводка за сутки с 19 на 20 декабря от НМ ЛНР". Донецк 24 (in Russian). Retrieved 20 December 2018. ^ "ведення щодо обстановки в районі проведення операції Об'єднаних сил станом на 18:00 20 грудня 2018 року" (in Ukrainian). MoD. 20 December 2018. Retrieved 20 December 2018. ^ a b "Зведення щодо обстановки в районі проведення операції Об'єднаних сил станом на 07:00 21 грудня 2018 року" (in Ukrainian). MoD. 21 December 2018. Retrieved 21 December 2018. ^ "Militants launched eight attacks on Ukrainian troops in Donbas in last day". Ukrinform. 21 December 2018. Retrieved 21 December 2018. ^ "В зоне обстрела ВФУ оказались Зайцево, Ясиноватая, Крутая Балка, Спартак, Жабичево, Вольво-центр и поселок шахты "Трудовская" в Донецке, Старомихайловка, Ленинское, Саханка - СЦКК". 21 December 2018. Retrieved 21 December 2018. ^ "ВСУ порядка 150 раз совершали обстрелы ДНР за неделю". News Front - Новостной Фронт. Новости Мира России Украины (in Russian). Retrieved 23 December 2018. ^ "Оперативная сводка за сутки с 20 на 21 декабря". Народная милиция ЛНР | Официальный сайт (in Russian). Retrieved 21 December 2018. ^ "Зведення щодо обстановки в районі проведення операції Об'єднаних сил станом на 18:00 21 грудня 2018 року" (in Ukrainian). MoD. 21 December 2018. Retrieved 21 December 2018. ^ a b "Зведення щодо обстановки в районі проведення операції Об'єднаних сил станом на 07:00 28 грудня 2018 року" (in Ukrainian). MoD. 22 December 2018. Retrieved 22 December 2018. ^ "Militants launched seven attacks on Ukrainian troops in Donbas in last day". Ukrinform. 22 December 2018. Retrieved 22 December 2018. ^ "За сутки ВФУ 23 раза нарушили режим прекращения огня, применив порядка 50 боеприпасов - СЦКК". 22 December 2018. Retrieved 22 December 2018. ^ "Оперативная сводка за сутки с 21 на 22 декабря". Народная милиция ЛНР | Официальный сайт (in Russian). Retrieved 22 December 2018. ^ "Операція об'єднаних сил / Joint forces operation | Зведення станом на 18:00 22 грудня 2018 року" (in Ukrainian). Press-centre of the JFO HQ. 22 December 2018. Retrieved 22 December 2018. ^ a b "Зведення щодо обстановки в районі проведення операції Об'єднаних сил станом на 07:00 23 грудня 2018 року" (in Ukrainian). MoD. 23 December 2018. Retrieved 23 December 2018. ^ "ВФУ обстреляли территорию Республики по трем направлениям, поврежден жилой дом - СЦКК". 23 December 2018. Retrieved 23 December 2018. ^ "Оперативная сводка за сутки с 22 на 23 декабря". Народная милиция ЛНР | Официальный сайт (in Russian). Retrieved 23 December 2018. ^ "Зведення щодо обстановки в районі проведення операції Об'єднаних сил станом на 18:00 23 грудня 2018 року" (in Ukrainian). MoD. 23 December 2018. Retrieved 23 December 2018. ^ "Операція об'єднаних сил / Joint forces operation | Зведення станом на 07:00 24 грудня 2018 року" (in Ukrainian). Press-centre of the JFO HQ. 24 December 2018. Retrieved 24 December 2018. ^ Cite error: The named reference MoD7am12-24 was invoked but never defined (see the help page). ^ "За сутки ВФУ применили по территории Республики более 290 боеприпасов - СЦКК". 24 December 2018. Retrieved 24 December 2018. ^ "Оперативная сводка за сутки с 23 на 24 декабря". Народная милиция ЛНР | Официальный сайт (in Russian). Retrieved 24 December 2018. ^ "Зведення щодо обстановки в районі проведення операції Об'єднаних сил станом на 18:00 24 грудня 2018 року" (in Ukrainian). MoD. 24 December 2018. Retrieved 24 December 2018. ^ a b "Зведення щодо обстановки в районі проведення операції Об'єднаних сил станом на 07:00 25 грудня 2018 року" (in Ukrainian). MoD. 25 December 2018. Retrieved 25 December 2018. ^ "Militants launched 20 attacks on Ukrainian troops in Donbas in last day". Ukrinform. 25 December 2018. Retrieved 25 December 2018. ^ "ВФУ вели обстрелы по трем направлениям, повреждены жилые дома - СЦКК". 25 December 2018. Retrieved 25 December 2018. ^ "Оперативная сводка за сутки с 24 на 25 декабря". Народная милиция ЛНР | Официальный сайт (in Russian). Retrieved 25 December 2018. ^ "Зведення щодо обстановки в районі проведення операції Об'єднаних сил станом на 18:00 25 грудня 2018 року" (in Ukrainian). MoD. 25 December 2018. Retrieved 25 December 2018. ^ a b "Зведення щодо обстановки в районі проведення операції Об'єднаних сил станом на 07:00 28 грудня 2018 року" (in Ukrainian). MoD. 26 December 2018. Retrieved 26 December 2018. ^ "Militants launched 5 attacks on Ukrainian troops in Donbas in last day". Ukrinform. 26 December 2018. Retrieved 26 December 2018. ^ a b "ВФУ обстреляли населенные пункты ДНР на всех направлениях - СЦКК". 26 December 2018. Retrieved 26 December 2018. ^ "Оперативная сводка за сутки с 25 на 26 декабря". Народная милиция ЛНР | Официальный сайт (in Russian). Retrieved 26 December 2018. ^ "Зведення щодо обстановки в районі проведення операції Об'єднаних сил станом на 18:00 26 грудня 2018 року" (in Ukrainian). MoD. 26 December 2018. Retrieved 26 December 2018. ^ a b "Зведення щодо обстановки в районі проведення операції Об'єднаних сил станом на 07:00 27 грудня 2018 року" (in Ukrainian). MoD. 27 December 2018. Retrieved 27 December 2018. ^ "Militants launched 7 attacks on Ukrainian troops in Donbas in last day". Ukrinform. 27 December 2018. Retrieved 27 December 2018. ^ Донецк 24. "Сводка нарушений режима прекращения огня с 26 по 27 декабря - СЦКК". Донецк 24 (in Russian). Retrieved 27 December 2018. ^ Донецк 24. "Оперативная сводка за сутки с 26 на 27 декабря от НМ ЛНР". Донецк 24 (in Russian). Retrieved 27 December 2018. ^ "Зведення щодо обстановки в районі проведення операції Об'єднаних сил станом на 18:00 27 грудня 2018 року" (in Ukrainian). MoD. 27 December 2018. Retrieved 27 December 2018. ^ "Операція об'єднаних сил / Joint forces operation | Зведення станом на 07:00 28 грудня 2018 року" (in Ukrainian). Press-centre of the JFO HQ. 27 December 2018. Retrieved 27 December 2018. ^ a b "Зведення щодо обстановки проведення операції Об'єднаних сил станом на 07:00 28.12.2018" (in Ukrainian). MoD. 28 December 2018. Retrieved 28 December 2018. ^ "Militants launched eight attacks on Ukrainian troops in Donbas in last day". Ukrinform. 28 December 2018. Retrieved 28 December 2018. ^ "На Донбассе все же согласовали «новогоднее перемирие»". News Front - Новостной Фронт. Новости Мира России Украины (in Russian). Retrieved 28 December 2018. ^ "New ceasefire in E Ukraine to start on Dec. 29: media". Xinhua News Agency. 28 December 2018. Retrieved 28 December 2018. ^ "В зоне обстрела ВФУ оказались Зайцево, Ясиноватая, Крутая Балка, Спартак, Жабичево, Вольво-центр и поселок шахты "Трудовская" в Донецке, Старомихайловка, Украинское, Ленинское, Октябрь, Саханка - СЦКК". 28 December 2018. Retrieved 28 December 2018. ^ "Противник продолжает обстрелы населенных пунктов Республики – Эдуард Басурин (видео)". 28 December 2018. Retrieved 28 December 2018. ^ Донецк 24. "Оперативная сводка за сутки с 27 на 28 декабря от НМ ЛНР". Донецк 24 (in Russian). Retrieved 29 December 2018. ^ "Зведення щодо обстановки в районі проведення операції Об'єднаних сил станом на 18:00 28 грудня 2018 року" (in Ukrainian). MoD. 28 December 2018. Retrieved 28 December 2018. ^ a b "Зведення щодо обстановки в районі проведення операції Об'єднаних сил станом на 07:00 29 грудня 2018 року" (in Ukrainian). MoD. 29 December 2018. Retrieved 29 December 2018. ^ "Militants launched 11 attacks on Ukrainian troops in Donbas in last day". Ukrinform. 29 December 2018. Retrieved 29 December 2018. ^ Донецк 24. "Сводка нарушений режима прекращения огня с 28 по 29 декабря - СЦКК". Донецк 24 (in Russian). Retrieved 29 December 2018. ^ "Оперативная сводка за сутки с 28 на 29 декабря". Народная милиция ЛНР | Официальный сайт (in Russian). Retrieved 29 December 2018. ^ "Зведення щодо обстановки в районі проведення операції Об'єднаних сил станом на 18:00 29 грудня 2018 року" (in Ukrainian). MoD. 29 December 2018. Retrieved 29 December 2018. ^ "Операція об'єднаних сил / Joint forces operation | Зведення станом на 07:00 30 грудня 2018 року" (in Ukrainian). Press-centre of the JFO HQ. 30 December 2018. Retrieved 30 December 2018. ^ a b "Зведення щодо обстановки в районі проведення операції Об'єднаних сил станом на 07:00 30 грудня 2018 року" (in Ukrainian). MoD. 30 December 2018. Retrieved 30 December 2018. ^ Донецк 24. "ВФУ обстреляли Жабичево". Донецк 24 (in Russian). Retrieved 29 December 2018. ^ Донецк 24. "ВФУ обстреляли Ленинское". Донецк 24 (in Russian). Retrieved 29 December 2018. ^ a b c d "Брифінг речника Міністерства оборони України щодо обстановки в районі проведення операції Об'єднаних сил" [Briefing of the spokesman of the Ministry of Defense of Ukraine on the situation in the area of the operation of the Joint Forces] (in Ukrainian). MoD. 30 December 2018. Retrieved 30 December 2018. ^ "ВФУ четыре раза нарушили режим прекращения огня - СЦКК". 30 December 2018. Retrieved 30 December 2018. ^ "Оперативная сводка за сутки с 29 на 30 декабря". Народная милиция ЛНР | Официальный сайт (in Russian). Retrieved 30 December 2018. ^ "Зведення щодо обстановки в районі проведення операції Об'єднаних сил станом на 18:00 30 грудня 2018 року" (in Ukrainian). MoD. 30 December 2018. Retrieved 30 December 2018. ^ a b "Зведення щодо обстановки в районі проведення операції Об'єднаних сил станом на 07:00 31 грудня 2018 року" (in Ukrainian). MoD. 31 December 2018. Retrieved 31 December 2018. ^ "Militants continue to launch attacks on Ukrainian troops in Donbas". Ukrinform. 31 December 2018. Retrieved 31 December 2018. ^ Донецк 24. "ВФУ обстреляли Спартак". Донецк 24 (in Russian). Retrieved 30 December 2018. ^ Донецк 24. "Сводка нарушений режима прекращения огня с 30 по 31 декабря - СЦКК". Донецк 24 (in Russian). Retrieved 3 January 2019. ^ Донецк 24. "Оперативная сводка за сутки с 30 на 31 декабря от НМ ЛНР". Донецк 24 (in Russian). Retrieved 3 January 2019. ^ "Зведення щодо обстановки в районі проведення операції Об'єднаних сил станом на 18:00 31 грудня 2018 року" (in Ukrainian). MoD. 31 December 2018. Retrieved 31 December 2018. ^ "Зведення щодо обстановки в районі проведення операції Об'єднаних сил станом на 07:00 01 січня 2019 року" (in Ukrainian). MoD. 1 January 2019. Retrieved 1 January 2019. ^ ""New Year truce": Ukraine reports two WIAs amid four enemy attacks in Donbas | Two enemy troops were killed and another three were wounded, intelligence reports say". UNIAN. 1 January 2019. Retrieved 1 January 2019.